I need your advice on an urgent basis. 1. Working as Business Development Manager (Womenswear) in a well to do fashion & tech startup. 5. My USP: Shifted to fashion (where my passion lies) from technical background and will be continuing my career in the same field. 6. 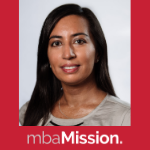 Reason for MBA : Need to learn more concepts & its applications, and to be exposed to more case studies, network, and work in a more advance domain. Problem Statement : I have given GMAT twice (alongside my work) and got a score of 650. This does not reflect the best of my abilities. I am certain that if I leave work, and give my 100% to my preparation towards MBA (GMAT+ Application) I will see the results and will pan out well. However, if I leave my work at the moment, and apply in the second round, I will have a gap of 3-4 months. I need to know how does this reflect on my profile? My mind is currently torn apart with pros and cons. Hi there, and thanks for writing! I would not recommend leaving your job to focus on the GMAT/applications - admissions committees expect that all candidates are juggling full-time work with the application process. If you leave, they'll be concerned about your ability to balance different prioritites (something business school students definitely need to do while they're in the program). I hope that helps a bit - do let me know of any other questions!